The studio finally comes into the 21st Century. Really. 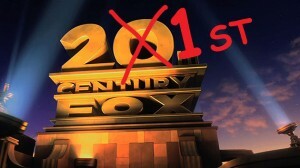 After 76 years – and 12 years after entering a new century, the studio known as 20th Century Fox is embarking on a new name: 21st Century Fox. The name change comes as parent company News Corp. is separating its publishing assets from its entertainment division, announced last June. Rupert Murdoch would be named chairman and CEO of the latter. The publishing assets would include the New York Post, The Wall Street Journal, HarperCollins and other businesses in Australia. The entertainment assets include the Fox network, the station group, movie studio, and various cable networks, such as Fox News, FX, and the upcoming Fox Sports One. The studio was founded in 1935 as a result of a merger between Fox Film Corp. (founded by William Fox in 1915) and Twentieth Century Pictures. The television division was founded in 1949 as TCF Television Productions and was renamed Twentieth Television in 1989. There is no word on what the exact new name of Fox’s syndication unit would be, though its expected to have 21st in its title. NewsCorp isn’t the only studio playing the renaming game; recently, The Walt Disney Co. renamed its syndication arm ABC Syndication according to its page on the SNTA website, replacing Disney-ABC Domestic Television, which in turn, replaced Buena Vista Television. ABC Syndication is not related to ABC Films, the former syndication unit of the original ABC Inc., which was spun off as Worldvision Enterprises in 1973, and now part of CBS Corporation. Now the question is… is Futurama now going to be produced by 31st Century Fox Television? great author.I will remember to bookmark your blog and may come back very soon.